Josephus Flavius (Yosef ben Matityhau) was an ancient Jewish priest, general and historian. He was, by his own account, a traitor and turncoat who defected to the Roman side during the Great Jewish Revolt . He is both a very problematic figure and a very crucial one as a historian, for his account of the Jewish revolt was to shape Jewish national attitudes for nearly 2,000 years. Josephus was a more than competent historian who was, at one time or another, apparently educated in the Greek and Roman traditions as well as the Jewish law and lore. He wrote several books, all of which have survived intact. His histories show the influence of Polybius, Sallust and other Greek and Roman writers, in the best and worst ways, including his profession to adhere to the truth and this invented speeches and embroidered tales, as well as his important geographic and other digressions. Josephus was born into a priestly family about 37 or 38 CE in Jerusalem and died about 101 in Rome. He claimed descent from priestly ancestors and from the Hashmonean dynasty as well. He related in his autobiography that between the ages of 16 and 19 he tried the sect of the Essenes, and then that of the Sadducees (tsdokim) and the Pharisees. Additionally, he had supposedly managed to spend 3 years in the desert with a flagellant hermit called Banus. This is probably either a misreading or a deliberate deception, because if he had spent three years in the desert, he would have had little or no time to "try" any of the sects, especially since the Essene cult itself required training. According to his own account, he resolved that the Pharisees were correct in their approach and became a priest in Jerusalem. His subsequent behavior does not especially bear out his claim of being a loyal Pharisee. When he was 26 years old, (in 63 or 64), during the procuratorship of Felix, he went to Rome to negotiate the release of several priests held hostage by the emperor Nero. He apparently found favor there, especially with Poppea, the wife of Nero, and likewise was entranced with the cosmopolitan atmosphere. When he and the priests returned home, Josephus relates that the country was on the brink of a revolt against Roman rule, and the Roman procurator Gessius Florus. The causes could not be hard to find. Judea was no longer an independent kingdom, but was rather ruled as a province, which meant that taxes were generally extortionate, governors and procurators did as they pleased, and of course, non-Jews were free to insult the Jewish religion. Josephus himself was in Jerusalem, and insists that he did his utmost to quell the revolt which had begun in Caesaria and soon spread to the capital. It should be understood that by this time, the non-Jews in all of the mixed cities, beginning with Caesaria, had risen and murdered all the Jews. They even murdered Jews who fought on their side against the Jewish rebels. The Romans offered no protection to the Jews. Florus, totally corrupt, had accepted a bribe of eight talents from the Jews, but then turned on them anyhow. The rebels in Jerusalem succeeded in overcoming the Roman forces initially sent against them. The moderates, including Josephus, still counseled against war. Yet at the same time, despite his supposedly demonstrated pro-Roman sympathies, he was sent to organize the resistance of the Galilee. Sent to the north, he supposedly trained his troops in the Roman manner, but he quarreled with one John of Gischala and Justus of Tiberias by turns. His autobiography, isa self-justifying document centering on this period, and relating in detail various sordid and petty plots that these others hatched against him, so that the account of the Jewish war in his autobiography looks rather like he is trying to describe wars between Jews, rather than a war between the Jews and the Romans. When the Roman armies under Vespasian and Titus finally arrived, Josephus's forces, such as they were, melted away, and he beat a more or less orderly retreat to Jotapata with a small force, where he withstood a siege by Vespasian for a time. When the walls of the city were breached he hid in an underground "den" with a number of soldiers. Discovered by the Romans who demanded his surrender, and perceiving that they would not kill him, According to his own account, Josephus tricked the others who were with him into killing each other by drawing lots, and he and another man (whose is never identified) escaped. If there was such a lottery, it is almost certain that Josephus had rigged it, since otherwise his "stratagem" of persuading his supporters to murder each other would have been no stratagem at all. Josephus won the favor of Vespasian by predicting he would be emperor, and when the prediction came true, Vespasian and his son Titus, and their descendants kept Josephus comfortable. Josephus no doubt made himself useful to the Romans in providing intelligence of the Jewish forces and their organization. He relates unabashedly his role in demoralizing the population of Jerusalem by exhorting them to surrender, with false promises of mercy, after he had apparently seen himself whole towns sold into slavery. Josephus travelled with Vespasian to Alexandria, and was evidently not present in Judea for the latter part of the war. His history of the Jewish war for this period, including the famous siege of Masada (or Massada) was reconstructed from the Roman military records and second hand accounts. Arriving in Rome following the defeat of his own people, Josephus was soon established in style and comfort. He was adopted into the Flavian family by the emperor and assumed the name Josephus Flavius. Somewhat unexpectedly, he did not desert his own religion, but only his national cause, and he remained an able defender of the Jewish faith. As Polybius was a defender of Greek culture and antiquity, but a detractor of Greek politics, so Josephus became a defender of Jewish culture and antiquity, but a detractor of Jewish political conduct. In Rome, Josephus began his career as a philosopher and historian. The first book he wrote, with the aid of Vespasian and Titus, was the Jewish War, which related the Jewish revolt and his part in it, written or completed about 75-79 CE, originally in Aramaic (now lost) . It was later translated into Greek and apparently much improved with the help of others, for Josephus' own Greek was not up to standard. This work was received favorably by Titus and Vespasian and became the official history of the wars from the Roman point of view. It was apparently copied out extensively and sent to all corners of the Roman Empire. Supposedly, the Jewish Wars was from the first intended to have been part of a larger work that would tell the story of the Jews, but it was cut out and written and published separately. Josephus did go on to write the much more ambitious work. By 94 or 95 he had completed the Jewish Antiquities, which told that story of the Jewish people from earliest times. This history was to become very valuable because it is is the only surviving account, other than the books of the Maccabbees, of the history of the Jewish people following the return from Babylonian exile. Soon after, between 97 and 99, Josephus wrote two other works, though the sequence is disputed. One work, which came to be known as "Against Apion," is a rather skilful defense of Jewish traditions and the Jewish religion and history against various slanderers, especially one Apion, an anti-Semitic Greco-Egyptian grammarian. A second work, Josephus's so-called "autobiography," was for the most part, as we have seen, a justification of his actions as commander in the Galilee. He wrote this work to answer a rival account by Justus of Tiberius, a fellow leader of the revolt. Justus sought to blame the revolt on Josephus, while Josephus blamed it on Justus in large part. Josephus evidently died some time time soon after. Josephus's works are remarkable in that they are probably the only major works of Roman and Greek ancient history that survived intact. Unlike the pagan authors, Josephus was beloved of the Church, for he told of the times of Jesus Christ and his tale of the suffering and wickedness of the Jews suited Christian theology of the time very well. In various manuscripts, anonymous Christian authors interpolated vague references to Jesus Christ and alleged miracles that he performed, in order to improve the "edifying" value of the Josephus histories. Jerome called Josephus the Greek Livy. The "Jewish Livy" might have been more appropriate. Like Livy, he indeed told the tale of his people from the earliest days, but unlike Livy he had also commanded armies and been involved in the business of government, considered essential qualifications for an ancient historiographer. Also unlike Livy, his mission was not to justify the imperial pretensions of his people, but to prove why the the conquest of Judea by the Romans was inevitable. numbers of people in an army or populations of cities or victims of massacres. Often had to rely on unreliable measurements and accounts of geographic features, almost never described battles very well (except Julius Caesar) felt that they were free to invent speeches for protagonists as they saw fit and to rewrite the texts of treaties and documents even when they were supposedly quoting them. Josephus, is the only source for some of the events prior to his life as well as for the history of the Jewish war. We have no other surviving account of Jewish history for several hundred years preceding the Maccabees, or for the time of Herod. Evidently he relied mostly on the Old Testament for the earliest history. 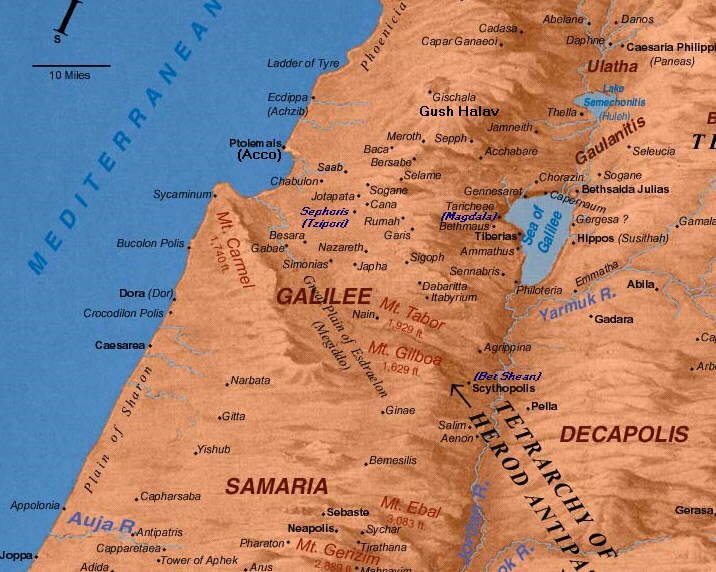 The map of the Galilee below will help in understanding the locus of major action in Josephus's battles during the Jewish War. Josephus is very uneven in his presentation of detail. He may spend several pages describing some trivial quarrel and devote almost no space at all to critical events. An ancient historical account in Greco-Roman tradition was not complete and acceptably stylish without a few miraculous auguries and prophecies, talking cows and sweating statues, after the manner of Livy, and Josephus supplies some of his own "prophecies" as well as other signs and portents. Josephus, unlike Polybius or Thucydides, did not really have a larger view of history and events, other than his purpose of showing the antiquity and importance of the Jews on the one hand, their petty divisiveness and materialism, and the inevitability of their defeat by the Romans on the other. Or perhaps, it is more accurate to say that he avoided discussing the larger causes of the war in order to avoid the displeasure of his Roman patrons. Much of his history is engaged in Byzantine minutiae and in relating the results of quarrels, divisions and betrayals that seem to be without any sensible cause. His powers of narrative and organization, and attention to chronology are also deficient in many cases. For example, while he relates many aspects of the siege of Masada in minute detail, Josephus neglects the time element, so that we do not know if Masada fell in 73 or 74. Events are often related in a somewhat disjointed fashion. He may tell us of the isolated doings of kings without telling us when or how they had become kings, what were the major results of their rule, or what was the political status of the Jewish commonwealth at any particular time, particularly under Maccabean rule. Josephus' relation of events themselves is often choppy and confusing. Not surprisingly, no two people who read Josephus may come away with the narrative for any given set of events. One will be convinced that the siege of Massada was long and another that it was brief. A third will miss the explanation that some people escaped the suicide pact, which is tagged on at the end of the story, and will therefore complain that there was no way that Josephus could have known what took place there, as there were no survivors. Therefore it is somewhat unfair to attack the "Massada myth" or other distortions of Josephus, as if people intentionally distorted all aspects of the story. Josephus's account of his mission in the Galilee is unclear and uneven. A point that is generally neglected is that in Book 2, Chapter 21 of the Jewish War, he relates clearly that the authorities in Jerusalem tried to remove him from power. He provides an elaborate alibi based on his vilification of John of Gischala (Gush Chalav) to excuse this attempt to remove him as the result of a nefarious plot, but it is clear that an army was sent to bring him back to Jerusalem and that he managed to intimidate and disperse them. We have only his account of why the authorities wanted to remove him, which is ostensibly that he was becoming too covetous of power in their view, and might march on Jerusalem. Actually, they may have wanted to remove him because of his cruel government, because they were afraid he was stirring up revolt and provoking the Romans, or contrarily, because they were afraid Josephus was going to betray the Galilee to the Romans. In his autobiography, Josephus gives the impression that he was sent to the Galilee to restore order, while in the Jewish Wars he notes that he had fortified numerous cities against the Romans, and had put down a revolt in Tiberias as well as trying to correct the defection of Sephoris (Tzipori). One of the most problematic and poorly told parts of Josephus's history of the Jewish revolt - and a crucial one - is the account of his desertion and betrayal of the Jews at Jotapata, in Book 3, Chapter 8 of the Jewish war. Josephus first tells us that he had found an underground hiding place, the size of which is not clear. Later he adds, as though he had been relating a story orally and forgot to tell us, that there were other Jews with him, though it is not clear if these were all defenders or included women and children or how many there were. They were betrayed by a "woman who had been with them." It is not clear if this woman had run away or had simply been allowed to leave, which would have been incredibly foolish, or what she was doing in this underground place. Josephus tells us that the people with him "came up to him in a body" as though they were in a large open space rather than a small underground hideaway. Not one of the names of these people is given, which is very odd for Josephus. According to Josephus, for some reason, the Romans, who were without mercy to other Jewish commanders, were eager to take Josephus alive and sent an acquaintance to persuade him, rather than simply setting fire to the hiding place. Josephus contrived to persuade the Jews to draw lots in order to determine in what order they would die. Can we believe him that it just so happened. by luck as it were, that his name came up as among the last to be killed. And when he was taken captive, he bought further liberties simply by conveniently prophesying that Vespasian would be Caesar. That Vespasian would need Josephus to tell him he would be Caesar or would want him to do so. In the Roman Empire, singling out someone as the next emperor was a fairly sure way of getting that person killed. Nero did not die until 68. Vespasian became emperor in July of 69. Jotapata fell in in July of 67. Not only did Josephus's supposed prophecy strain credulity, it would have been deleterious to Vespasian's health had it been related to Nero. As he himself was supposedly there, this vague and poorly constructed narrative cannot be set down to poor documentation. Is it all an invention to cover the truth of Josephus' treachery, which was even worse? The existence of Roman accounts would not have contradicted a cover story, if it had been constructed with the collaboration of the Romans. All the participants other than Josephus and one other unnamed person were dead. The unnamed survivor could be invented to provide credibility for the story, as long as that person never had to be produced. The Maccabean kings and their successors were quarrelsome and greedy and often cruel. Jewish society was riven by senseless petty disputes and jealousies that led to its downfall, owing to the materialistic and lawless nature of society. The war party were nothing better than lawless louts driven by greed. Armed resistance was hopeless and pointless without the assistance of God, who no longer favored the Jews. Romans were merciful, so there was no point in resistance. The facts we know are not necessarily always in line with this assessment Josephus himself relates senseless slaughters of people who had surrendered, such as at Taricheae (Magdala), and beastly cruelties of both Tiberias and Titus. Surrender did not seem like a viable option after all, except perhaps for the few traitors who were spared. Josephus also tells us in Jewish Wars, Book 2, Chapter 18:1 that the non-Jews had supposedly slaughtered 20,000 of their Jewish neighbors in Caesaria at the inception of the Jewish revolt, and he tells us that similar slaughters were occurring in other towns. From the rebel perspective, it may well have seemed that it was better to die fighting than to simply give up and be torn apart by the mob, slaughtered by the Romans or sold into slavery. Lawless bandits who are only out for material gain ("Sicarii," as Josephus called them, a slang word roughly equivalent to "goombas") do not take on well organized armies in hopeless causes - they would run away or join the enemy. Nonetheless, the epithet of "Sicarii" stuck to the rebels in Jerusalem and Masada and this obviously distorted account was accepted uncritically, because it was useful for supporting the rule of rabbinical Judaism after the fall of the temple and ensuring the cooperation of the populace, except in the most extreme cases, when the tyranny became impossible to bear, as it did in the days of the revolt and again under Hadrian. The mass of the Jewish peasantry who just wanted to be left in peace. The internecine civil wars among the Hasmoneans, which led to the Roman takeover and Herodian rule, showed how utterly bereft of political legitimacy the dynasty had become. This view is reconstructed largely from the account of Josephus. The Jewish rabbis, however, were not too well acquainted with Greco-Roman culture, the Roman Modus Operandi and the traditions of Greco-Roman historiography. To someone who has read Livy, Caesar and Polybius, the accounts of Jewish in-fighting and lawlessness and petty rivalry have a boring familiarity. The Romans and their Greek apologists told the same dreary tales of their Italian, Gallic and Greek rivals. According to their ideas, these peoples had an inexhaustible supply of rascals and bullies, who for the purposes of political gain, power or riches, were willing to risk a horrible and almost certain death in revolt, or to divide the people for no reason in the face of the enemy, and were always eager for a "novis rebus" (meaning revolt, literally a "new thing" - translated unfortunately by Whiston as "innovation"). These evil folks never had any motives related to ideals, freedom or larger and more noble political goals, according to the Roman story. There irrational groups of bandits and thugs kept cropping up by coincidence, if we believe Roman historians, in every place that the Romans went. The Romans were always forced to intervene and restore order and virtue, against their will as it were. Thus, quite by coincidence, the Romans came to rule more and more cities and acquired an empire in a fit of absent mindedness. It is hardly a likely story. It is probable, and believed by many, that the Romans deliberately incited these various quarrels, usually siding with the nobility against other classes, or siding with outsiders against rulers, because conquering a city offered much more booty than defending it. The original intervention of the Romans in Jerusalem was ostensibly for the purposes of aiding one side in a dynastic war. They came to "help" and stayed to rule. They ensured that Judea would be ungovernable without them. The various divisions among different groups of people and interests were encouraged, with those who were loyal to Rome being rewarded amply for their loyalty and services. If Josephus' account of the unrolling of history often seems like a "tale told by an idiot, full of sound and fury and signifying nothing" it is probably not an accident. Thucydides had taught that there were two sorts of causes in history: the superficial "complaint" based on particular incidents, and the "true" underlying causes, which he diligently sought out. Josephus and other Roman apologists deliberately took the opposite approach - magnifying the most trivial events as if they were the real causes of war and misery, and ignoring true causes entirely. Now the occasion of this war was by no means proportionable to those heavy calamities which it brought upon us. He goes on to tell a story about a synagogue that was owned by a Greek, who was intent on hampering Jewish worship by building around the synagogue. He tells us how the Jews bribed Florus to protect them, but some Greeks deliberately sacrificed birds in front of the synagogue and defiled it, creating a provocation. The birds caused the war, or some subsequent and equally trivial incident according to Josephus, for there was a string of such seemingly uncaused incidents. But who gave the gentiles the notion that they could provoke the Jews with impunity? Why did these incidents keep occurring? Why weren't the ordinarily efficient Romans intent on keeping order? How did it come about that the Jews were dependent on the Romans even for trivial protection in matters such as these? If we look at the story another way, Josephus's story is suspicious. According to Josephus, Florus needlessly and senselessly provoked the Jews, even when the leaders of the Jews did their best to appease him. Instead of quelling the disturbance in Caesaria, he marched on Jerusalem, attacked the Jews, robbed their treasury and the houses of individuals and refused to be pacified, killing over 2,000 as punishment for no reason. If this is what happened, or what the Jews perceived as happening, it discredited the ruling pro-Roman Jewish faction and eventually had to lead to a revolt. But what motive could Florus have to act in this way? Was Josephus setting up Florus as a convenient villain in order to settle scores of the Flavian clan or perhaps political accounts of his own? Ancient armies could rarely be really large, because large armies created difficult supply problems. For the most part, therefore, armies were not self-sufficient and could not operate without being supplied by the local populace. This means that in order to create the conditions that made long term conquest and occupation and garrisoning possible, it was necessary to create a proper political atmosphere in the occupied country and to find allies there. Otherwise, conquests would be too expensive to maintain. The dictum that surrender was the only sensible course for the Jews (or the Greeks or Gauls) might only be true if the Jews or other subject peoples were made to believe it was true and collaborated with their conquerors. That was the role of Josephus in the siege of Jerusalem, and very likely that was the function assigned by the Romans to Josephus' history. Grant M, The Ancient Historians, Barnes and Noble, 1994, pp 243- 270, 399-401. Josephus Flavius, The Jewish Wars.